On July 27, 2017, the U.S. Department of Transportation’s Federal Motor Carrier Safety Administration (FMCSA) published a Federal Register notice announcing a 24-month Crash Preventability Demonstration Program to review the preventability of certain crashes. The FMCSA is requiring motor carriers or drivers to provide substantial evidence that proves the crash was not preventable. Some of the information that is required to be provided will be police accident reports, insurance documents, videos, and any other documents described in the Federal Register notice. 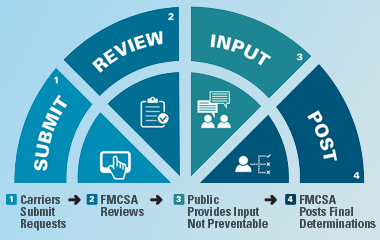 The FMCSA will continue to list all crashes on the public safety Measurement System website where a notice will now appear saying that the crash was reviewed and determined to be either preventable to non-preventable, or in some cases undecided. Get started today with our Carrier Performance Monitoring on hazMAX™ to make sure your operation is not being negatively impacted by not at fault accidents. Talk to a TCA representative to learn how our proprietary system can aid your daily operations!